Living coral Abstract painting. Contemporary ART. Original artwork. Beach decor. (As seen in Warner Bros. Supergirl Season 1-2 Interior Decor, IKEA, British VOGUE, Elements of Style, HGTV Magazine). Original Abstract Paintings and Large art prints for great wall Decor. Each Original Abstract Painting is handmade by us, Antonia and Fabio, full time artists based in Rome, Italy. Our limited edition prints are all printed with latest Archival Inks on thick High Museum Quality Italian Paper and Cotton Canvas! Duealberi AS SEEN In Warner Bros. Supergirl Season 1-2 Interior Decor - 2016-2017, IKEA - 2017, British VOGUE - May 2017, Elements of Style - August 2015, Sweet As A Candy (Italy) - October 2017, Young House Love - Dec 2016, Jour Nelle - Nov 2016, Flaunt and Center - Oct 2016, Centsational Girl - Oct 2016, House of Hawkes - Jun 2015, This is Jayne Wayne (VOGUE partner blog Germany) - Jun 2015, HGTV Magazine - Jan 2015, Houzz - Oct 2014, Best of Etsy - Mar 2014, Bestotted - Oct 2013, Lovely Clusters - Jun 2012, Designlike - May 2012, Daily Dream Decor - Jan 2012, Flowerona - Dec 2011. Please, convo us and together we can make a unique painting for you. All of our Paintings and Prints are professionally packed with special care and shipped within 3 business days . Our Artwork arrives always safely in time WORLDWIDE. You will receive a DHL notification email with tracking number . Colorful painting. Original artwork, Abstract painting, Beach house decor. Colorful Abstract painting. Modern painting. Original artwork. Beach decor. Living coral painting. 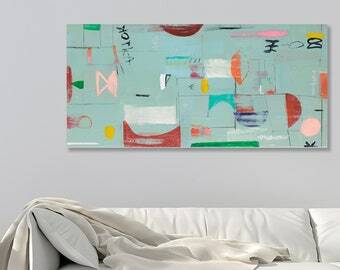 Original art, Abstract painting, beach house decor. Coral painting. 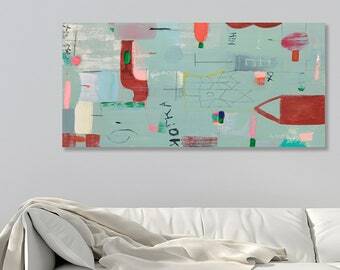 Original artwork, Abstract painting, vacation house decor. Living coral painting. Original artwork, Abstract painting, Beach house decor. Colorful Abstract painting. Contemporary ART. Original artwork. Beach decor. Antonia & Fabio are simply amazing! Shipping was fast and carefully packaged. Their communication and responsiveness were quick. And above all, the artwork is SO good! The colors bring so much life to our space and we couldn't be more happy to support these artists. Grazie mille amici! 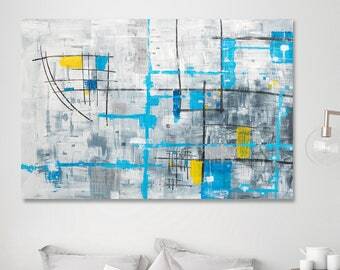 ABSTRACT PAINTING, original wall art. colorful abstract art, bedroom wall art 63x32"
Duealberi art has appeared on Warner Bros. TV Show Supergirl in Kara s apartment. A.F. DUEALBERI is a creative international duo, Antonia & Fabio, based in Rome Italy. 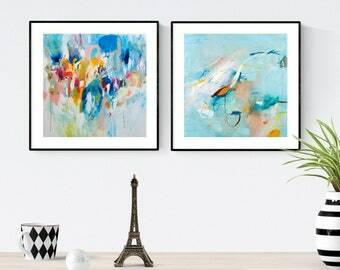 We specialize in the creation of Abstract Paintings and Large Art Prints for Home Decor, Interior Design, and Contemporary Spaces. Our art has appeared in Warner Bros. Supergirl Season 1&2 Interior Decor. IKEA has recently selected our artwork from our Black and White Series, for “TVILLING 2" poster that is being now sold worldwide in every Store. We work closely with interior designers and decorators on different projects all over the world, mainly in the U.S., Australia, U.K., Europe, and Japan. We work also directly with final clients worldwide and have sold our work in more than 30 countries. We have retailers for our art prints in Japan, Sweden, and NYC. Our style is contemporary, playful and fun, with bold and fresh colors that give the space an extra touch of artistic personality and uniqueness. Deeply influenced by Abstract Expressionism, our abstract art is about how our child eyes see. 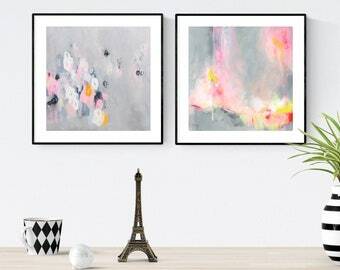 Besides from the abstract art, we design also more minimalist contemporary nature prints. Two full time, self-representing, self-successful, selling artists. Both actively leave their “standard job” starting from 2010. The first step was made by Antonia, M.A. in Literature that gave up a successful corporate communications executive job to pursue her newly found connection with creativity and painting. Then followed by Fabio, M.A. in Architecture, full time involved in construction design & project management, leaved it all behind. We both gave up our standard and regular paycheck to pursue something greater and much more valuable for us. 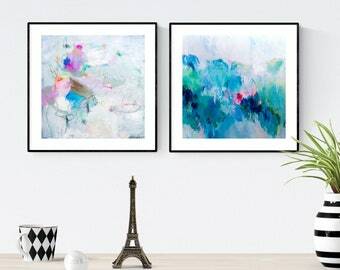 We took a leap of faith in exploring our artistic side.and creating our own job We really love what we do and now enjoy creating abstract paintings and prints for home interiors, set decor, and hotel decor. “Working for ourselves and being able to create with our own hands, to design art and home accessories, is the best thing we have ever done in our life.". Over 1800 artworks sold to art collectors in more than 30 countries worldwide, throughout the United States, Canada, Europe, Brazil, Japan, Australia, New Zealand, the United Arab Emirates, Singapore, and Hong King. Owner, Maker, Designer, Curator, Photography, Shipping. Antonia & Fabio from DUEALBERI are two full time, self-representing, self-successful, selling artists. Over 1700 artworks sold by the end of 2016, to art collectors in more than 30 countries worldwide. Welcome to DUEALBERI abstract art shop! 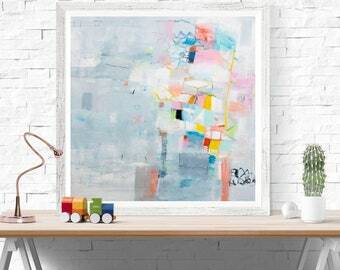 Here you will find original abstract paintings and fine art giclee prints. We are glad to ship our large wall art, with extreme care, all over the world. You do the order and then we will take care of the rest and make sure the artwork arrives safely to you!! Contact us for any custom order and commissioned work. Duealberi fine art prints are museum quality, original, and hand signed by us. Each original piece of art is reproduced with a professional award-winning giclée equipment, utilizing only finest archival materials and pigment inks. This quality of giclée print is commonly used in museums, art galleries, and photographic galleries. Giclée printing is known to be the best quality printing around. The giclée prints are preferred by the galleries and museums for their exceptional longevity and richness of colors. The paper is acid-free and extremely age resistant. Frames are not included as they are for presentation purposes only. We would like you to be our happy and satisfied customer! We ship internationally, therefore refund conditions vary depending on the case. Our products are artwork prints that go through customs, both in Italy and then US, (if for example you are buying from the US) therefore, if for some reason you think you want to buy and ask for a refund the next day, please read the following so you understand better how the process is fully inverted on your behalf in terms of responsabilities and costs (shipping, Vat, custom fees, insurance, etc). Regarding the expected "arrival date": please note that those are "esitmated" and may vary due to several factors such as quantity of orders in cue and other delay elements out of our control such as custom procedures or courier seasonal delay. Although it is rare, it may occur and it will not be subject to any sort of refund. In any case our delivery is very fast, within a few days from order. If you have some particular urgence we kindly request to point it out before the order so we may bring it on the fast lane. -If your piece gets lost or damaged, we offer a replacement or full refund. -In case of Damage, we require it is filed immedeately upon same day of arrival. It is compulsory to take photos on the same day of arrival, of the package and the damaged painting, notify us and the shipping company (DHL) via Email in order to file properly the case. -If damage report is not filed as described above we will not consider it a damaged case. -If you are unhappy with your piece or delivery time we will offer a refund up to 7 days after receipt, on the condition that the piece is returned undamaged, and with registered tracking code. The buyer has 7 days, including day of arrival to notify us by email and Etsy conversation. Once the item arrives intact to our premises and buyer has provided at their cost to carefully repack and process the shipment back through customs with their choosen carrier, we will proccess the refund. -Any returning shipping costs such as Customs, VAT, additional Fees or Custom Fines. We do not take responsibilityfor lost/damaged packages that are shipped back to us. If the package is lost during returning process we will not Refund. -Custom orders and made to order works, as they are specially made. -30 % advanced payment of a custom order during preliminary painting phase. -Unclaimed packages that have arrived to your destination but for any reason are not picked up or recipient is absent or unavailable. We do not refund if it may return back after registered delivery attempts by courier. It is responsability of the buyer to follow up the delivery and be available for reception once shipped. -Any package that is involved in your active change of delivery conditions by calling or instructing courier to perform different actions than ones given by us. (see "*compulsory shipping rule*" in shipping policies below). -Any package that is lost or damaged during return process. -Any package damaged or not consigned in the event of any modification on your behalf of delivery terms : If you call the courier and modify any shipping condition, such as delivery address, signature rule, or instruct to leave package in front of door or in any other premises different from original delivery address, we do not take responsability of any loss that may occur. -Any returning shipping costs such as Customs, VAT, additional Fees or Custom Fines that occur during returning process. Be sure to follow the tracking of your package through your local tracking DHL service once we give you the International Tracking ID. -Any shipping cost sustained to send the product to the client. Refund involves only Product price if refund conditions are met. -Any "free shipping" fees (mentioned above)that will be deducted in case of request of refund. -Any shipping that arrived "late". We ship only after we have received the payment and after having received a local phone number for "DHL shipping purposes". The number will be not used for any other reason. A local phone number is required to coordinate any safe arrival of package with DHL courier. We cannot process the order without it. The order will be cancelled within 2 weeks if we do not receive a number. We ship all over the world with Premium Shipping Service. Each delivery is safely tracked. Regarding the expected "arrival date": please note that those are "esitmated" and may vary due to several factors such as quantity of orders in cue,local holidays and other delay elements out of our control such as custom procedures etc. Although any delay is rare, it may occur and it will not be subject to any sort of refund as the order is in its natural processing time. In any case our delivery is very fast, within a few days from order. NOTE: If you have some particular urgence we kindly request to point it out before the order so we may bring it on the fast lane, otherwise it will be processed accordingly to our timeline. We will send all shipments to your ETSY address, therefore, please make sure your Etsy address is correct. Please leave a real street address and not a PO Box address, as we ship with a Courier and they do not deliver to PO Box addresses. Please also be sure to leave us a local phone number required for a better shipping experience and safe arrival. Thank you! In the event of any package damaged, delayed or not consigned combined with any registered modification on your behalf of delivery terms without our written permission during which you deliberetaly call the courier and instruct to modify any shipping condition, such as delivery address, signature rule, or instruct to leave package in front of door or in any other premises different from original delivery address, we do not take responsability of any loss that may occur and you loose our granted refund policy. -All Small Prints up to 12x12" are carefuly packed in sturdy and protective thick cardboard mailers. Once we ship, delivery time to your door is usually 2-4 business days. All paintings and prints are original and hand signed on the back by the artists Antonia and Fabio Duealberi. All work is protected under copyright including reproduction rights. Please note that sale of artwork does not transfer copyright. Artists retain all copyright privileges and protections. That means you can own the actual artwork but not the copyrighted image. Artwork may not be cut and pasted, published, copied, or reproduced in any way without written permission of the artists. We want you to be happy and completely satisfied! Please don't hesitate to contact us in private convo if you have any request. We love creating commissioned artworks! Please contact us on Etsy if you have any special request. A commissioned painting is a completely new painting that may be inspired by a previous one, but it has its own life and personality. We work with the flow of inspiration, therefore if you would like to commission an artwork, we assume that you guys love what we do. We will paint especially and only for you the new painting. This means that any new painting will always be different from the previous ones and one-of-a-kind. 1) We assume that if you ask for a commissioned painting, you like our style and body of work, therefore you wish to include in your collection a new painting made by us especially for you. 2) We ask you to indicate a Duealberi painting that in particular caught your attention just as a starting point. 3) We will create a new artwork in the size you need, being inspired by the painting you indicated and thinking of you. We retain full freedom in the interpretation which may vary day by day. Each piece is a new original piece of art. 5) Once gathered initial information on which we agree, we will start the commissioned painting. 6) Once painted in total freedom, we will show you a picture of the new painting for your approval, so you may decide if you wish to proceed with final payment. 7) We reserve the possibility to evaluate and do only 1 very small reasonable adjustment. Each painting is created in a spontaneous manner. 8) We are sure you will love the new painting! If however you are not satisfied with the picture we send to you, we then assume that the commission is automatically interrupted and the 30% non refundable advanced payment is retained. 8) The 30% non refundable advanced payment cannot be exchanged with any other good in the store as it is related to the commissioned time and effort spent painting the artwork. 10) You fully accept all "Duealberi Commissioned Paintings Terms and Conditions" from 1 to 10. We can ship internationally paintings up to 40x40" ready to hang and flat. Larger sizes come unstretched, rolled in a rigid and protective tube. They need to be stretched at your local framers, this is something quite normal and any framer is able to do that. To fulfil your order, you must provide us with certain information (which you authorized Etsy to provide to us), such as your name, email address, postal address, payment information, and the details of the product that you’re ordering. You may also choose to provide us with additional personal information (for a custom order), if you contact me directly. Or send us a local phone number that we explicitly ask you to send after purchase, in order to fulfull a safe and fast international delivery, required by our chosen third party delivery service. 3) Disclose any information requested regarding your purchase information and item description required by customs authorities. We accept commissioned orders, such as a new painting in a specific size or some color variation made specifically for you. A commissioned painting cannot be a reproduction of the original, like a printer would do, it is a completely new painting that may be inspired by a previous one, but it has its own life and personality. We work with the flow of inspiration, therefore if you would like to commission an artwork, we assume that you love what we do. We will paint especially and only for you the new painting. Every painting is always one of a kind. We have a very fast high quality delivery service, setup to offer the best to our clients, so once the print or painting is ready to ship, it will get to you in 3 to 5 days max, with tracking code, directly from Italy. We ship daily to the US. Just leave a real street address (No PO BOX) when you order and remember to msg us a phone number, for shipping purposes, in order to process fast and safe Courier delivery with tracking code. What happens if the package is lost or damaged? No need to worry, It is a rare event, but just in case, you will be fully refunded ! 3) Let us know within 24 hours via message. We will take care of the rest. You will be immedeately fully refunded. No need to do anything else. Your satisfaction is the most important thing. Same thing if for some rare reason the package is lost. Each shipment has secure tracking code so we are able to trace everything. Thats what make us work worldwide easily with full client satisfaction. How do the prints on canvas arrive to me? -Prints on Canvas are printed on canvas, rolled in a tube. You will have to stretch them locally. Prints on Paper are prints on paper rolled in a tube. You will have to frame them locally. -Canvas print "READY TO HANG" option is a print on canvas but in this case already stretched. For now we offer a 40x40" canvas print ready to hang option. FRAME NOT INCLUDED on all READY TO HANG prints or paintings: The frame you see in the picture is only for illustrative purposes. What does "READY TO HANG" mean? You will receive a canvas painting stretched on wooden bars and there is a hook for hanging it on a wall. All our original paintings come ready to hang. You will receive a Canvas print, 40x40" (100x100cm) - Stretched on 0,8" (2cm) width wooden bars - white border. All Large prints on paper or canvas instead come rolled in a tube except for the option 40x40" "Ready to hang" on canvas. Can you crop a square print into a rectangular one? We normally do not crop our artwork. We print our artwork in limited edition and do not modify it. We have a number of rectangular prints listed in the Large Prints section, please have a look.